Today we are happy to announce the release of a new addition to our Easy Pulse Sensor series named Easy Pulse Plugin. Like its predecessors, the original Easy Pulse and Easy Pulse V1.1, Easy Pulse Plugin also operates on the principle of Photoplethysmography, which is an optical technique of sensing blood volume changes in tissues by illuminating the skin surface with a light source and measuring the reflected or transmitted light using a photodetector. The photodetector output contains the cardiovascular pulse wave, which is synchronized with the beating of the heart. Easy Pulse Plugin provides all necessary instrumentation and amplification on board to detect the cardiovascular pulse signal from the fingertip. The most important characteristics of Easy Pulse Plugin is that it can be easily plugged into the left headers of Arduino Uno (or its compatible clone) board for easy interfacing, and the analog pulse signal can be fed to either A0 or A1 analog input through a 2-pin jumper selection. 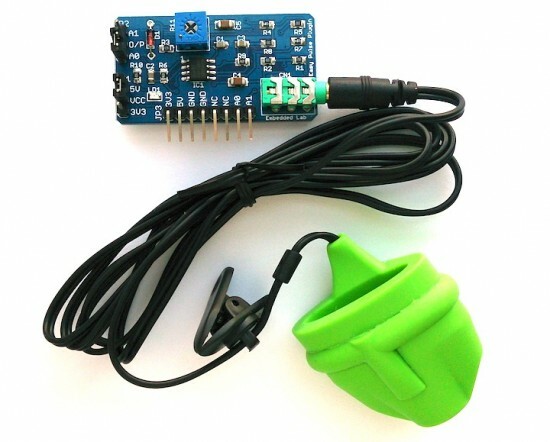 You can buy this sensor at our Tindie Store as well as from Elecrow with worldwide shipping. For schematic and theory of operation, please visit our previous Easy Pulse V1.1 page. It is mostly the same circuit except the Easy Pulse Plugin only provides analog pulse signal (no digital pulse output as in Easy Pulse V1.1). Compatible with both 5.0V and 3.3V interface. Select the operational voltage by placing jumper JP1 on appropriate position. Output pulse signal can be routed to A0 or A1 pin through jumper JP2. 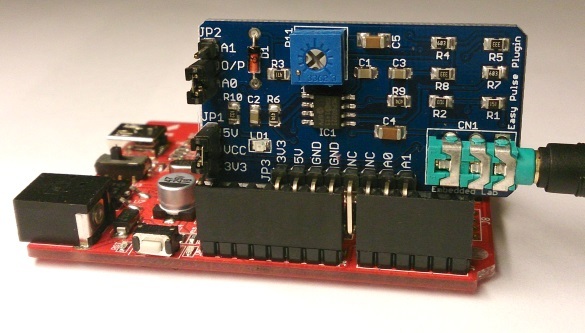 Easily plugs into a breadboard, Arduino Uno, chipKIT Uno32 and other compatible platforms. 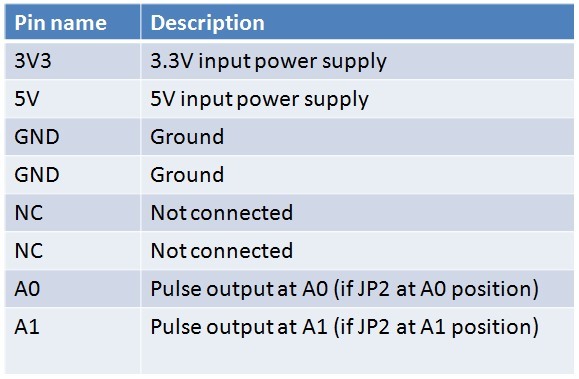 The following table shows the pin descriptions of Easy Pulse Plugin. Easy Pulse can be configured to operate at 3.3V or 5.0V through JP1 jumper. Similarly, the output pulse signal can be routed to either A0 or A1 pin through JP2 jumper. The following pictures illustrates the jumper settings for JP1 and JP2 for operating the sensor board at 3.3V and accessing the PPG output at the A1 pin. 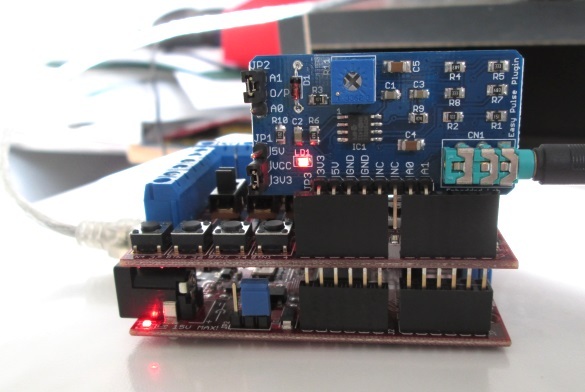 Easy Pulse Plugin and chipKit Uno 32: The first example shows a standalone digital pulse meter using Digilent’s chipKIT Uno32 board and chipKIT Basic I/O shield. 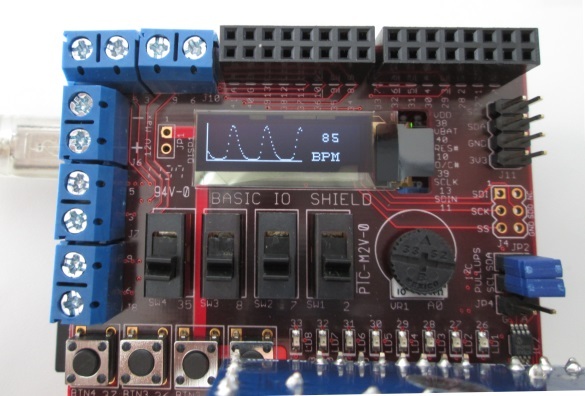 The I/O shield consists of an OLED display that is used in this project for displaying the pulse waveform and the pulse rate. The details of this project can be found here. Note that the JP1 and JP2 jumpers of Easy Pulse plugin should be placed on 3V3 and A1 positions for this project. 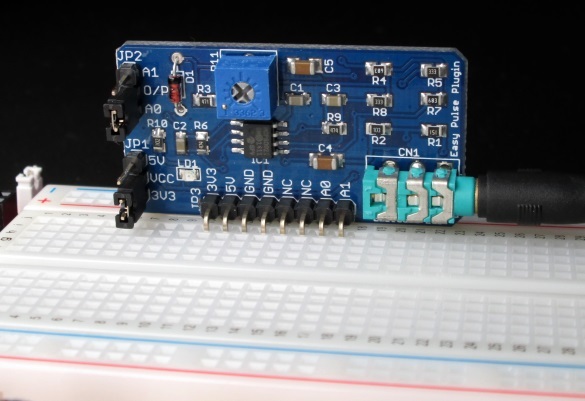 PC-based Pulse meter: This example illustrates how to make a PC-based heart rate monitor system using an Arduino Uno board and Easy Pulse Plugin. 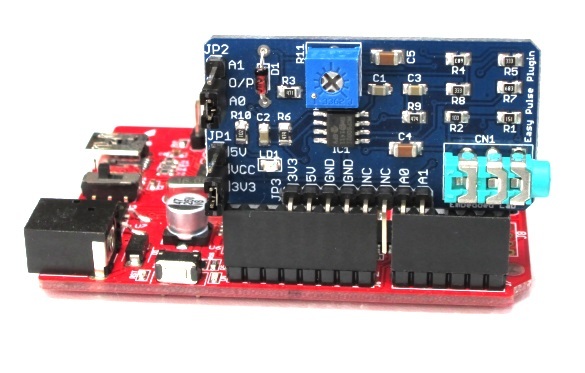 The sensor is operated at 5.0V and the output is read by the A0 anaog input pin on the Arduino board, which then transfers the data to the PC through a serial interface. A PC application is developed using Processing programming language to display the received PPG signal and instantaneous heart rate. More details on software can be found here. The following picture shows the required jumper settings and placement of Easy Pulse Plugin on Arduino Uno board. Important note: While operating the Easy Pulse sensor, make sure the sensor connector is inserted well and pushed all the way into the audio jack as shown below. Buy Easy Pulse Plugin at our Tindie Store. could you give me full detail information of this board to know what and how they work ? Could you tell me what the wavelength of the emitted IR light is? Thanks! Hi, it cannot be shipped to Taiwan. When will this product be sold on Elecrow? Thanks. Cool, but why re-invent the wheel? I just bought of the older version. I would have loved to have this one!!! It will be available this afternoon. The Tindie approves new listing manually, so taking some time.